SOME are petrified while others squeal at the mere sight of these scaly reptiles. Lizards that scurry past walls to hide and sometimes free-fall into the kitchen sink with a splat face a serious threat across the world. Scientists say climate change is one of the biggest reasons. There are around 5,461 lizard species across the world, of which around 270 are found in India. Though there is dearth of global data on the population decline of these reptiles, recent studies have shown that lizards are now at the mercy of environmental temperatures. A study carried out in Saudi Arabia and published in the July issue of Journal of Arid Environments found that the indigenous Uromastyxaegyptia microlepis or spiny-tailed lizard is declining fast. They linked it to the increase in temperature in the area. An earlier study by researchers at University of California in the US also indicated that lizards may be declining at a faster rate than thought. The team led by Barry Sinervo studied 48 lizard species belonging to Sceloporus genus (called spiny tail lizards) at 200 sites in Mexico and compared their population data with surveys of the same species between 1975 and 1995. The study was published last year in the May 14 issue of Science. The team found that 12 per cent of local lizard populations previously studied had been wiped out. They noted that lizard populations were declining even in undisturbed habitats, clearly indicating that there was something apart from habitat loss responsible. Based on the findings and data from worldwide, Sinervo, predicted roughly 20 per cent of the lizard species could go extinct by 2080. To prove their point the team used a device that mimicked the temperature of a lizard basking in the sun and studied the impact of rising temperature on the reptile’s physiology. The research was carried out at Yucatan Peninsula in Mexico where another researcher had observed populations of the blue spiny lizard (Sceloporus serrifer) fall over the course of his doctoral research. They kept the devices under the sun for four months. The device’s temperature fluctuated just like it would have for the lizard, and based on the recorded data it became clear the temperatures were too much for the lizards to bear. The researchers compared population figures with the weather data for the region over the years, and concluded global warming was the single biggest reason for the dwindling numbers. The spiny-tailed lizard in Saudi Arabia is also facing the heat. Biologists found that the lizard is an active thermo-regulator and comes out to bask in the sun. But as the temperature increases it recedes into burrows. They predict that rising temperatures will adversely affect the lizard populations in the region. So far, 12 species of lizards have been listed as extinct by the International Union for Conservation of Nature (IUCN). But this all is historical data and no recent additions have been made to the list. IUCN is carrying out a Global Reptile Assessment to ascertain the numbers. The ecology of lizards is not widely studied in India. “There are no long-term data collected using rigorous sampling and analytical method, available for any lizard species to actually say if the numbers have increased or reduced,” says Dilip Venugopal, who had ventured out in the Western Ghats last year to calculate population densities of the agamid lizards in tea and vanilla plantations. “It is all anecdotal inferences based on surveys, encounter rate or researchers’ field experiences,” Venugopal, now a researcher at University of Maryland in the US, adds. Similarly, Karthik Vasudevan of the Wildlife Institute of India, Dehradun, conducted a study to estimate Anamalai spiny lizard densities in the tea plantations in the shola grasslands in the Western Ghats. He found 45-50 individuals per hectare in the ghats. The number was comparable to the lizard densities in the forests. But he adds that there is a sizeable population of Anamalai spiny lizard in tea plantations that could decline with use of mechanised harvesting or land use change. “Our knowledge on the population of lizards is insufficient to indicate whether populations have declined,” he adds. 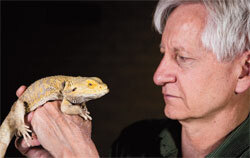 But Romulus Whitaker, a well-known Indian herpetologist, thinks that since most of the Indian lizards are low-altitude reptiles, they may not be susceptible to climate change influences in the same way as lizards in the temperate regions. There are two ways animal species respond to changing environmental conditions—they find more suitable habitats or they adopt physiologically to fight the conditions. Lizards, however, seem to find it difficult to evolve. Change is happening too fast and too soon for them. Thermoregulation, Sites points out, is the Achilles heel for lizards. “Thermal physiology is complex. The genetic component, or heritability, for that trait is known for at least spiny lizard. It is just 19 per cent.” This implies that very less of thermal physiology is controlled by genetics and more of it is under the influence of the environment. “This means the lizards cannot evolve thermal power to a higher level as fast as the climate change is occurring in the environment,” he adds. The decline in lizard populations will adversely affect the food chain. “They are what an ecologist calls energy capacitors,” says Sites. Lizards occupy a very low level in the food web and feed on insects, except for the huge monitor lizards found in India. The reptile is cold-blooded and ectotherm (depends on external body heat). “An endotherm like mammals and birds spends 95 per cent of its calories on maintaining itself. So they like to get food items that return more calories than spent on finding food,” says Sites. Lizards on the other hand spend only half their calories on maintaining themselves. So they can afford to eat insects birds cannot eat. “For this reason, they would be more abundant. If you knock out the lizard out of the food web—that is a whole lot of calories that is not there anymore. The big mammals and birds cannot make up to that,” he adds. Samraat Pawar, a biomathematician with UCLA Medical Center, California, says that whether an organism is going to affect the ecosystem depends on their numbers. In tropical communities, he adds, lizards might not have a huge impact because the ecology of the communities is driven by ants. But the decline will definitely have a localised impact. “The highest effect will be seen in higher temperate areas like Chakrata in Uttarakhand and Himachal Pradesh because these regions have greater densities of lizards,” Pawar, who studied lizards when he was with the Wildlife Institute of India, points out. Sites rues that most of the conservation efforts revolve around the bigger animals, like the big cats, but not lizards—even though they are quite significant for our biodiversity.